A guide for residential projects. Architects are trained to advise you on, and guide you through, all facets of a building project. Following is an outline explaining how a project is typically broken down into stages and some notes about each stage. This process is discussed at the initial meeting together with information on our services and fees. For a potential new project we normally meet with clients for an initial no-obligation discussion. This allows both parties to get a measure of each other while discussing the project. The meeting can either be at our office, in your current home or at the site. 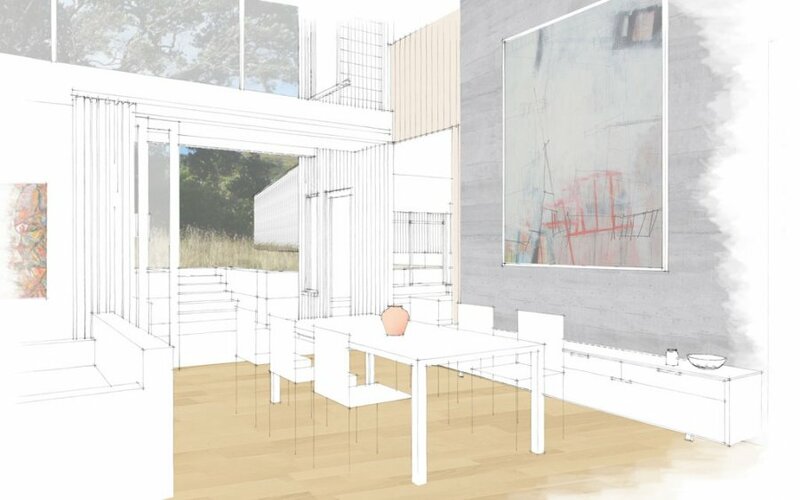 We want to hear your hopes and aspirations for the project, and we can take you through our general design philosophies and illustrate how these have been applied to previous projects. The information below is intended to give an indicative outline of the process involved in procuring a building (especially a house for a private client) in New Zealand. Our services are customised to suit clients’ needs so at an initial meeting we would discuss the services required specific to your project and our charges. You can ask us anything about the process of building procurement and we will advise on alternative methodologies and their advantages and disadvantages. The building process can be a complicated one and part of our job is to advise clients when they should use other specialist consultants. Taking advice from specialists early in a project can often save money and time in the long run. Depending on the complexity of the project we can provide some initial feasibility information about building costs, programme and site suitability in this first meeting. This is covered in more detail in the Pre-Design section. The design process works from the general to the particular, so it is important that you are completely comfortable with the design at the end of each stage, before we proceed to the next step. 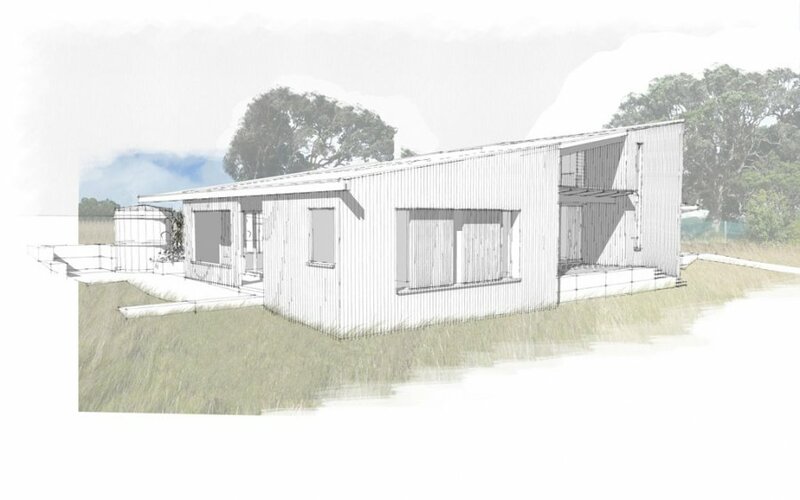 We can make a valuable contribution to your project before any design work begins by helping prepare a comprehensive architectural brief, advising on project feasibility including analysis of the site. The success of the project greatly benefits from a good quality brief. A brief is a description of the desired outcomes and it can include such things as the requirements and functions of the building, the activities and spaces to be accommodated, desired materials and finishes and your budgetary constraints. It is also essential that the proposed building be considered in qualitative terms too. We are trained to translate your hopes and aspirations into built form, but these are often more difficult to convey than the more prosaic requirements such as number of bedrooms required. We want to hear about your likes and dislikes in all aspects of design, architecture, art, fashion and way of life, and this can be prompted by images from books, magazines and the internet. We work hard to make our designs particular to their site and specific to their owners. Clients sometimes perceive a dilemma that displaying their own preferences and ideas will in some way restrict the creativity of their designer. We believe this fear is unwarranted for a number or reasons: there is usually broad scope for creativity and originality around any requirements; robust discussion of issues between architect and clients will usually lead to richer designs; the more input we have from clients the greater the chance that we can find individual personal aspects that can tie the design to its owners. Please download our residential briefing pro forma as a prompt. As part of the brief process we can advise you on the feasibility of the project in terms of budget planning, site analysis, programme requirements and any other professional services that may be required. We can guide you on selection of a suitable site based on your needs. Appropriate site selection may reduce the cost and increase the potential of the project. We advise on soil conditions, availability of services, local building regulations, heritage implications, resource consent issues, site orientation and views. We can also give advice on likely costs for phases of the building project such as site development costs, construction costs, furniture and fitout, landscaping and consultants fees. We will also discuss the programme for the project. This will take into account the nature of the project, the current state of the building market, site availability, your time requirements and our office workload. As a rough guide for a new house it may take 9-12 months from initial meeting to the builder starting on site, and another 12 months until you move in. Resource Consent issues can be a protracting factor. This stage involves deciphering opportunities and constraints within the proposed site or existing building, and then developing architectural solutions at a conceptual level. 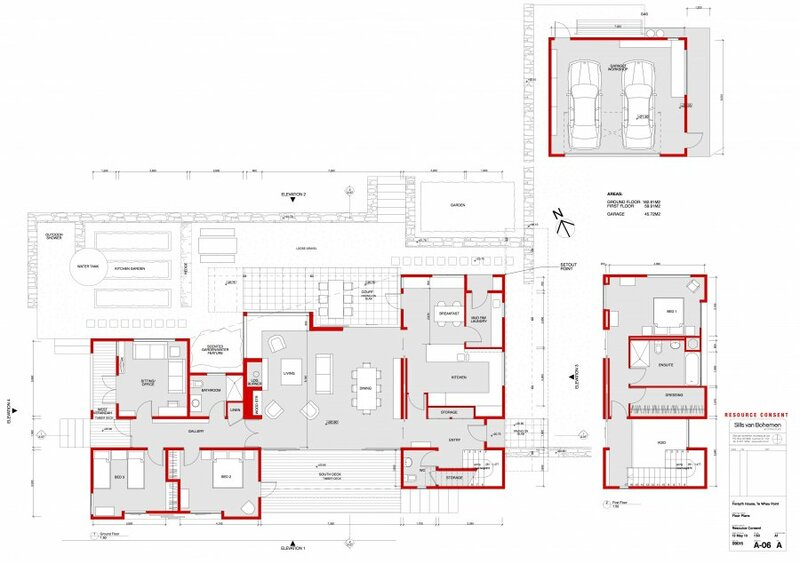 The outputs are usually space planning and site planning diagrams and plans, and initial 3d concept drawings. Together with you, we will come to terms with all the major items that will affect the design. These include prosaic, philosophical and aesthetic issues. It is important for us to understand your tastes and how you wish to live/work/worship/play in the building. However, it is worth noting that people’s tastes are based on their experiences so keeping an open mind may produce unexpected but happy results. Of course, we try to do the same. 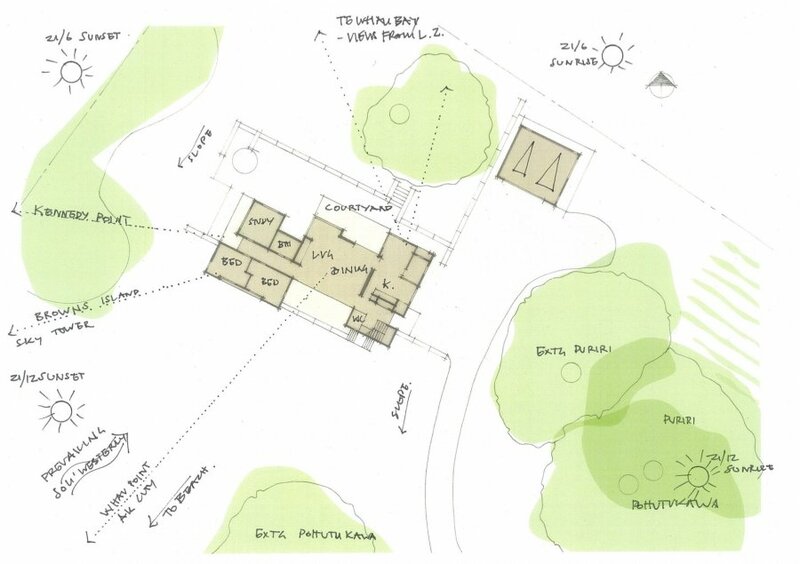 An analysis of local authority regulations, Resource Consent requirements, orientation, views, levels, heritage implications, legal requirements, relationship with neighbouring sites and available utilities and service routes all help give everyone some certainty with which to make decisions on the project’s direction. A survey of levels and boundaries is required in all but the most simple of site situations. We facilitate the engagement of a land surveyor to provide this information by briefing them on what is required. We will survey any existing buildings by measuring, drawing and taking photos. We will also assist in the decision on whether to engage a geotech engineer to gather soil conditions information and, if so, at which stage. 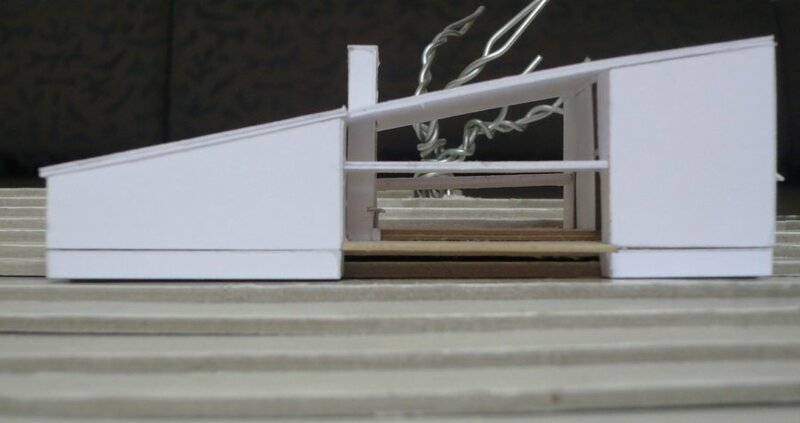 During this stage we will develop some key conceptual ideas that will drive the design. These develop in tandem with working through issues of the general form of the building and its relationship with the site and surrounding environment. 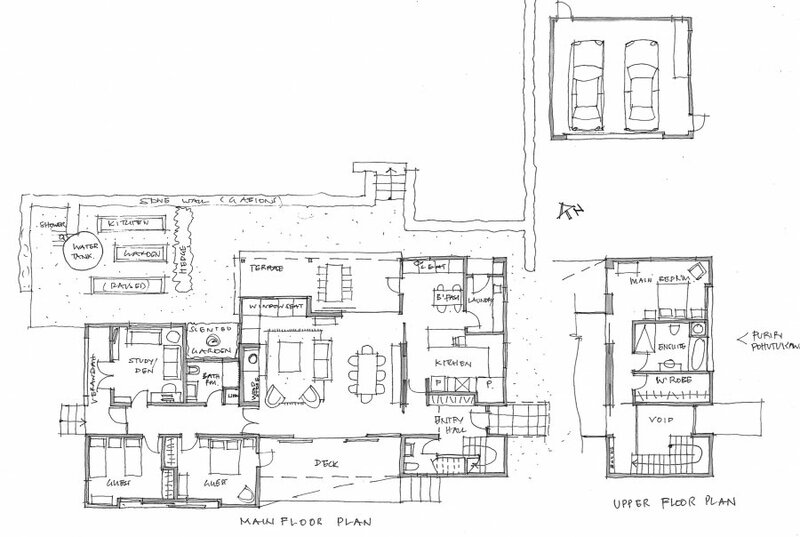 We will begin by drawing space schematics and diagrams and refine these to scaled floor plans. When we feel that we are on a worthwhile path we will begin to model the design in three dimensions. This provides a feedback loop where ideas are tested on the model and the results provide stimulus for further design ideas. A preferred concept is refined in this stage. At the conclusion of this stage you will have drawings that describe the preliminary design with scaled plans and elevations. We normally recommend that a Quantity Surveyor (QS) is engaged to provide a Preliminary Estimate of Costs based on the drawings and an outline specification. 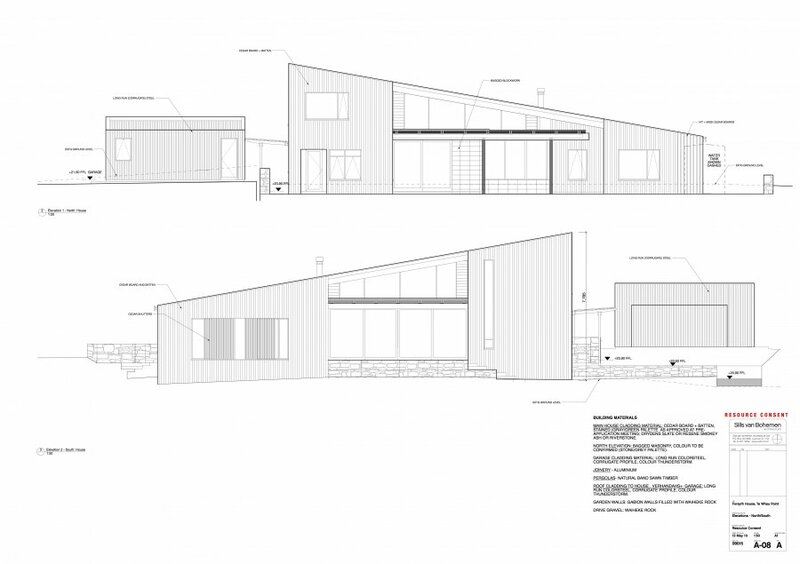 Once an estimate of costs has been obtained that everyone is comfortable with a Resource Consent application is made. We would usually apply for Resource Consent on your behalf unless the project involves particularly thorny consent issues, in which case we may recommend that a specialist town planning consultant is engaged to make the application together with our supporting documents. In this stage the design is refined and final decisions are made so that it is ready for Detail Design and Documentation (see below). We will make recommendations for the design of detail and the use of materials that reinforce the vision previously developed during Preliminary Design stage. 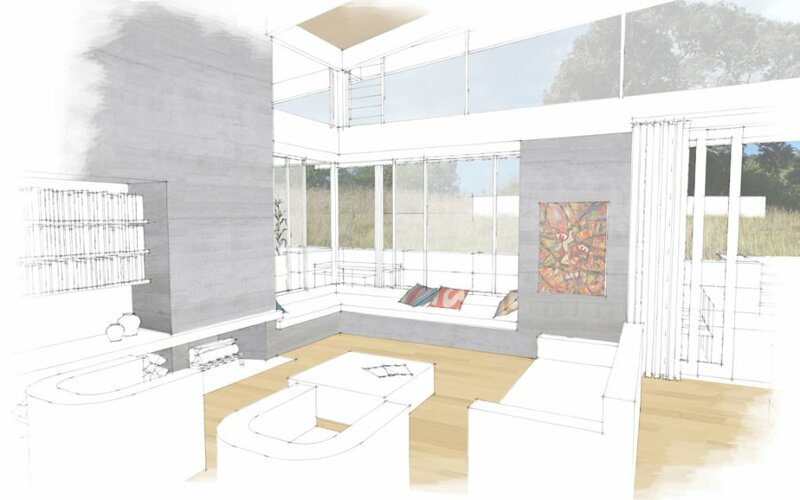 For a residential project there will be design of bathrooms, laundry and kitchen, and decisions made on fixtures, fittings and cabinetry throughout the house. We will also develop the detail contained in our computer model, giving it materials and working on the relationship with its landscaping. If there have been any major changes during this stage then the Quantity Surveyor can be asked to price the implications of these. It is important that everybody completely understands and is at ease with the design before starting the contract documents. For example, changing the position of a room near the end of the Contract Documentation stage can mean a great deal of work altering many drawings and may compromise other earlier design decisions. At the conclusion of Developed Design the building is sufficiently defined to give a clear understanding of the scope of work, costs and the architectural look and feel. This stage generally entails the most work for architects. A detailed description of the building work is put together that will form the contract between you and the builder. 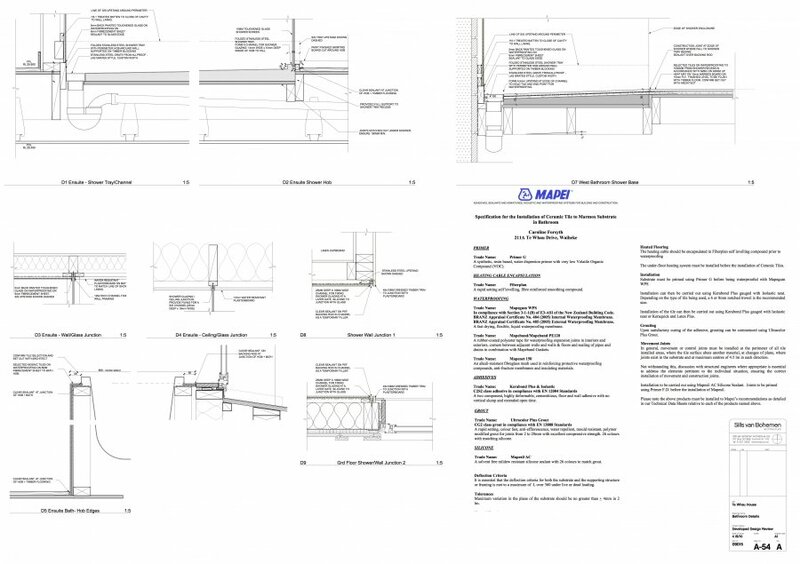 This includes general arrangement drawings, detail drawings, schedules (lists), specifications (written instructions) and contracts. This set of documents will be inspected by the council before they issue a building consent, and by the tenderers in preparing their competitive tender prices. Once construction begins these documents will be used to build from. During this stage we coordinate the work of any other consultants that are involved in the project and incorporate their information into the documents. It is important to document thoroughly to ensure a high quality of work and to maintain control over costs and design outcomes during construction. We can provide advice on methods of building procurement. Typically projects are tendered to selected contractors in order to gain a competitive fixed price. Other methods are available depending upon preferred timeframe, budget, desired quality and current economic climate. If a selected tender process is used then it is essential that most of this information is obtained and assessed before the builders are invited to tender, because it is usually understood that an invitation to tender denotes a willingness to accept a builder subject to a satisfactory price. The tender is run over a set period (usually three weeks), during which we answer questions and provide clarifications of the contract documents. Once tenders close, we review them for compliance with the tender documents, analyse the trade breakdown, clarify any exclusions and make recommendations. This is the construction stage of the project. The building is built under a contract between the Principal (you) and the Contractor (aka the Main Contractor and the builder). Most standard building contracts include provisions for the contract to be administered by an architect. Some contracts allow for administration by the owner or an independent agent. Under normal circumstances we would only take part in a project where we will be engaged to administer the contract. Having been responsible for the design and documentation, we have an intimate understanding of what is required from the Contractor, and are therefore in the best position to protect your interests by maintaining quality and enforcing time and cost requirements using our skills and professional judgement. The construction process is usually complex and most clients do not have the experience or the time to administer contracts on their own behalf. In the first two of these roles the architect is entitled to promote your interests. In the third, the architect must act absolutely impartially between you and the Contractor. During construction it is the Contractor’s ultimate responsibility to ensure that the work is completed in accordance with the contract documents. We visit the site at regular intervals to provide a second level of observation on your behalf. Prepare contract documents for signing by the Principal and the Contractor. Notify selected contractor and unsuccessful tenderers. Provide periodic site visits to observe progress and compliance with the contract documents. Convene project coordination and/or site meetings. Review and monitor Contractor’s programme. 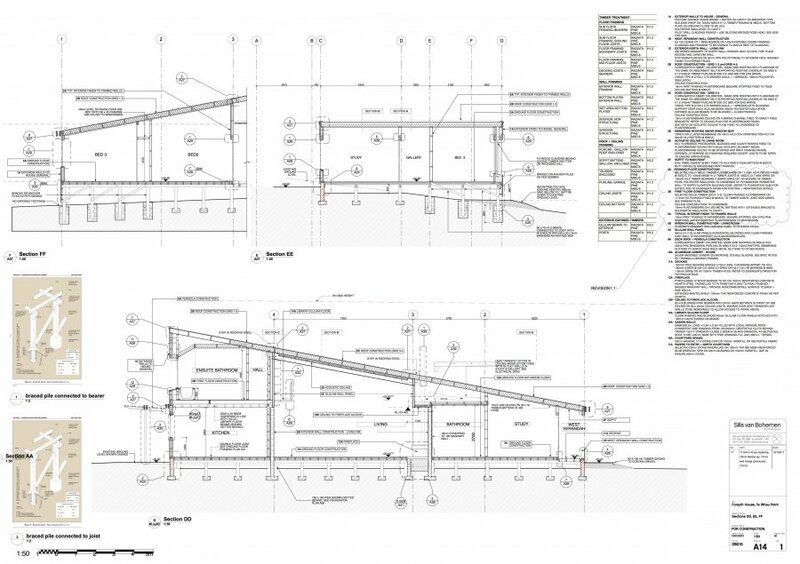 Review and annotate shop drawings. Liaise with and coordinate other consultants. Provide additional information or clarification to the Contractor to enable them to carry out the building. Issue variations and all instructions to contractual parties. Maintain records on costs including all variations. Give notices of change in contract time. Certify claims by the Contractor for payment and variations to the contract are valid. Make Practical Completion inspection and issue notice. Notification of faults during Defects Liability Period. Issue Defects Liability Period Certificate (project completion) and authorise release of retentions. It is important that clients are made aware of the costs of architectural services early in the relationship. Our charges will be specific to the complexity of the job. Fees can be based upon time charges, lump-sum fees, percentage fees or a combination of these. We use a standard NZIA agreement for architectural services as a contract between client and architect. We are happy to talk about fees and services and will give quotes once the scope of work is known. We generally use hourly charges for small amounts of work or if the scope of work hasn’t yet been decided. For those clients who prefer we can undertake the whole project on a time charge basis. A percentage fee is the traditional method of charging for architectural design work as it allows work to begin without knowing the full extent of that work. The percentage charged varies according to both the complexity and the value of the construction work (eg. owner-occupied residential projects tend to be more complex than motels, and therefore take longer to design and document for the same construction value, while the higher the construction value of the project the smaller the percentage required to cover the hours worked). The guide mentioned above gives tables showing estimated percentages that can be applied to different types and values of work. This percentage is applied to the market value (excluding GST) of all work designed and specified for the project by us or consultants coordinated by us. We invoice based upon Quantity Surveyor estimates of this amount until such time as a Contract Sum is fixed. We often charge a fixed fee, and this is calculated specifically for individual projects. This provides more certainty on overall costs for the client. To calculate a fixed fee requires that the scope of the architect’s work is also able to be defined, and this is not always possible at the beginning of a project where there is uncertainty over required outcomes. 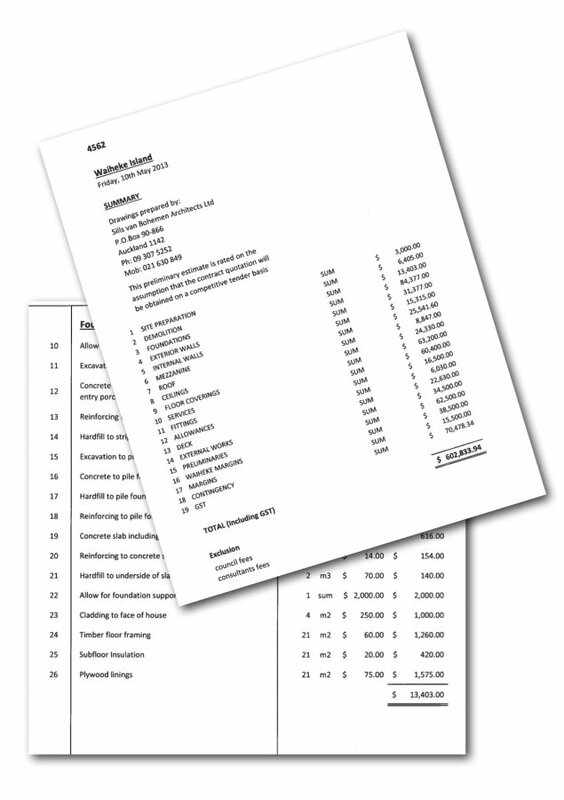 We also charge for some expense items such as printing of drawings and vehicle kilometres. Rates for disbursements are agreed before they are incurred.